Anna Liesemeyer from In Honor of Design! Congrats Anna! email me your address so I can get this sent out to you asap. 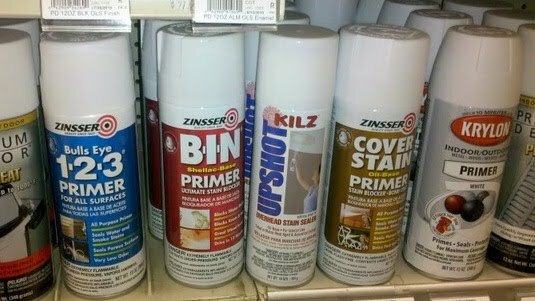 In other news, did you know that you could get my favorite Zinsser primer in a spray? I had no idea! I wish I knew this before I started my next painting project. It's just as fun as my painted tea box and a tad more colorful, interested yet? Keep an eye out for the post sometime this week. Can't believe I won! Thank you so much my dear! I've used the primer! It is a lot faster, though I guess I'm a little old school because I like rolling on my primer/paints! Oh exciting! Now I'm dying to know what the new paint project is! I found it in spray can a couple of weeks ago for a small project I had and it's been great to use! Look forward to the new project. V. interested...can't wait to see why you have up your sleeve!!! Had no idea primer came in a spray can....totally going to use that one of these days! Just found your blog--so very cute!! Can't wait to see the newest project! love your projects! can't wait! That's great! What is the new project?